Cheaper Car Hire for Northern Ireland. Compare MPV, SUV Rental in Belfast & Northern Ireland. Compare prices of quality discounted car hire in Belfast and Northern Ireland. Then either book on the price, or click the link to choose your car hire company. Email quotes can also be sent. Choose your supplier from:- Alamo, Avis, Budget, Dooley, Enterprise, Europcar, InterRent or Sixt. All offer discounted prices on their normal rates, with same level of service and vehicle quality as if went direct and paid more. Belfast is connected with Dublin in the south, by the M1 motorway, bringing down the time of travel between Belfast and Dublin to under three hours, traffic prevailing. Ensure you have some Euros for the Toll Bridge, just past the Ballbrigan exit. There is no need to exit the motorway to fill up on fuel, since the opening of new petrol/est areas. Making Waves in Northern Ireland! 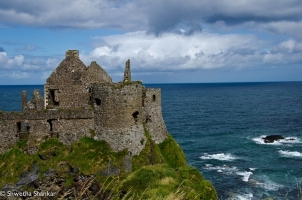 - Drive your hire car along the coast, and see the Giants Causeway. On the west coast, there is surf, that according to what local surfers are saying, leaves the height of some Hawaii breakers in the shade! But Hawaii has got to be warmer! 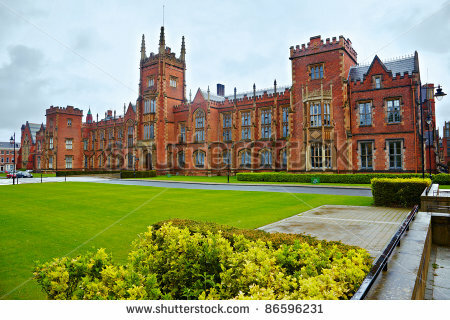 Popular pickup locations include Belfast City Airport and the small city of Derry Airport. If landing into Derry, then a short drive will bring you into county of Donegal and although wild and untamed it is well worth a visit, for a few days, or longer, to leave the city stress behind. Always book you car hire in Belfast early, as cars get sold out very quickly in peak season, especially Christmas and Easter. We offer cheaper motors in Northern Ireland. Budget vehicle prices in Northern Ireland. 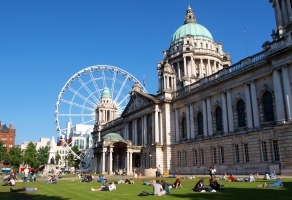 One ways car hire in Belfast itself, will incur a GBP35 extra fee with Alamo. If want to do a one way from Belfast to say Dublin, or Cork or other, with either Budget or Alamo, this can also be done, and extra will will also apply. Most car rentals will start from either the main international airport at Aldergrove, on the outskirts of Belfast, or the city airport, named after local football giant George Best, situated beside the city dockyards. Need car hire elsewhere in UK or Ireland? Check here for Ireland car hire and here if need UK vehicle rental next.